I found a wee bit of time to make a quick card, between painting, cleaning and reorganizing our bedroom. My stamps have been calling, as well as different challenges. 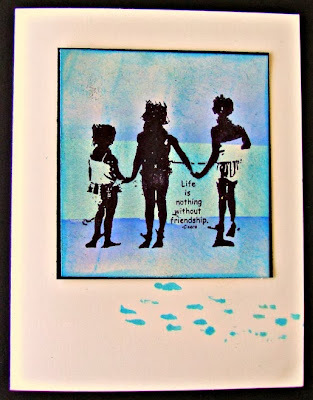 The Facebook Group De Craftorij is asking for something CAS, and Lisa's Blogger challenge this week is Black, white and one color, I choose blue......so we have blue footprints in the sand..... The stamp is from Stampotique. Hi Gerrie! This is darling...love that blue! Going through some of my stash of cards yesterday, I found a card made with this image. I find this to be such a powerful piece, I wonder why that is. Wonderful CAS card, love the pops of Blue and the sweet image. So what is the time??? Oh my, I have been working on cleaning and reorganizing, going through stuff and my poor stamps are so lonely as well! 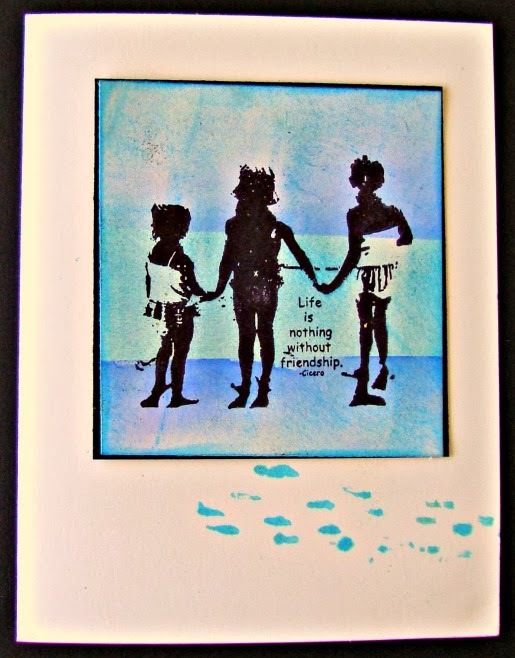 Love that background you created for the friends and what a great sentiment and so true! Well GF, enjoy that extra hour!